Trekking gears: Helmet, trekking boots (wet and dry trek), trekking pole, headlight, hammock, tent, sleeping bag, etc. 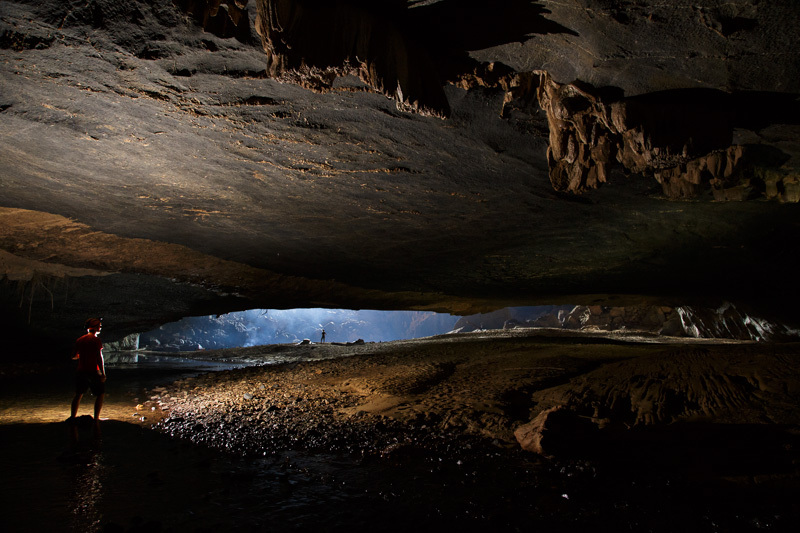 This tour is including 2-day trekking and is the best two-day tour deep into the National Park of Phong Nha. Trek down through the forest to the Ban Doong Village. Follow the Rao Thuong river valley to the cave entrance. You will explore the cave with our experienced English speaking guide, using top quality European standard caving equipment from Petzl. 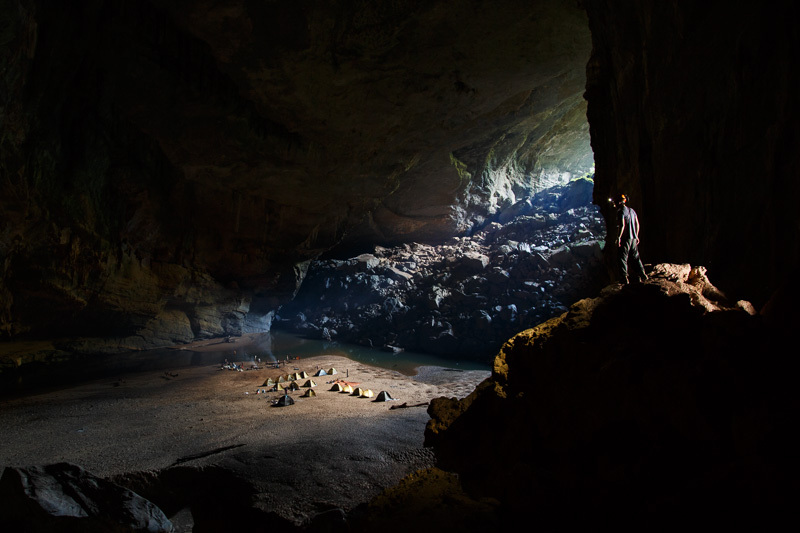 See some fascinating 300 million year old fossils; visit the impressive exit of Hang En over 120m high and 110m wide and climb down to the river valley that leads to Son Doong cave – the World’s biggest cave. We return via a different route in this huge cave back to camp for a well-earned rest and dinner. Watch the thousands of swifts return to the cave at dusk and try and spot a flying fox!! The return journey is once again through the superb river valley passing the minority village and back up the hill to the drop off point 35km from Phong Nha village. A cold beer or coke will be waiting for you after the steep climb up to the road. Overnight is spent in hammocks/tents in the cave. Before reaching the caves,your will explore the historic DMZ on the way from Hue and enjoy the authentic Chay Lap homestay (www.chaylap.org) on the first day arrival to Phong Nha. Enjoy the relaxing and starry night at the homestay at the doorstep of the National parkt is needed to charge your energy for the next 2-day trekking after a long ride accessing to Phong Nha area from the others. 09h00a.m: Our guide and driver will meet you at the airport/hotel in Hue and then depart for Phong Nha Ke Bang national park. En route, visit the 17th Parallel - Ben Hai river, the DMZ (demilitarized zone) of Vietnam from 1954-1972. Continue to Chay Lap homestay - nestled at the doorstep of Phong Nha Ke Bang national park, listed as a UNESCO World Heritage site since 2003. You are invited to prepare dinner with the host but only if you want! Later we meet the team at Phong Nha center for safety briefing and tour preparation. Breakfast, check-out the homestay. After briefing and fitting the gears, you’ll be transferred to KM35 of Ho Chi Minh Road – West wing. From KM35 point, start trekking along Rao Thuong valley. 13:30pm depart for Hang En. After around 2 hours trekking, we will reach to Hang En. Explore the cave. 18:00: Enjoy a tasty dinner and watch the swifts and maybe a flying fox. 20:00 Overnight at campsite in Hang En’s huge passage. Explore the dry passage that leads to a viewpoint high above the campsite. See the 300 million year old fossils. 13.30 Back up the hill!!! Cold drink and pick up to Phong Nha center. Transfer to Dong Hoi city or return Hue for your next destination. End the adventure in the Cave Kingdom.